Rent Dinah's Garden Hotel & Trader Vic's | Corporate Events | Wedding Locations, Event Spaces and Party Venues. Dinah’s Garden Hotel has been imaginatively designed to create an environment that is both relaxing and productive. We have chosen amenities like feather-soft beds outfitted with high-quality cotton sheets and La Naturel bath amenities to sooth the body and spirit. Family owned and operated since 1957, Dinah’s Garden Hotel in Palo Alto is a lush oasis in Silicon Valley, and was voted “Best Hotel in Palo Alto!” Dinah’s is located near Stanford and the headquarters for the world’s leading businesses. 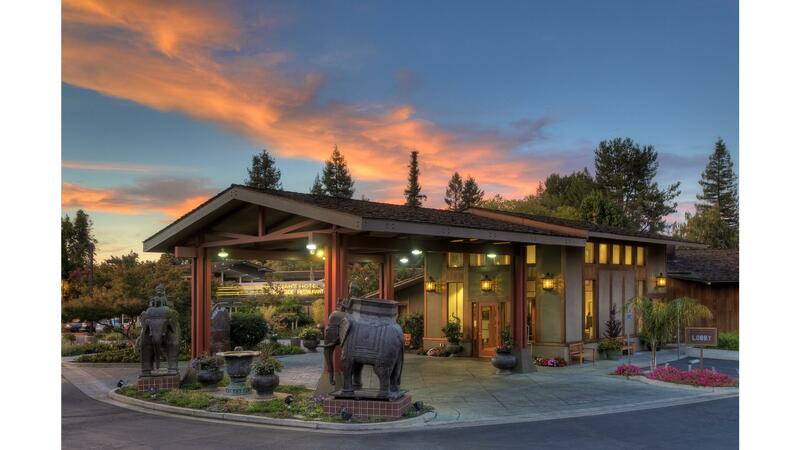 We are California Green Certified and feature gardens, Koi-filled lagoons, well-appointed guest rooms, banquet facilities, two restaurants, and art from around the world. All 97 guest rooms and 32 suites are inspired by decorum from around the globe – creating environments that are both relaxing and productive. In the mid 1950’s American travelers were enamored with the concept of "motor touring.” Motels, short for motor hotels, were popping up along highways all over the country. Raymond Handley and his partners were not interested in creating just another place for people to stay along busy roadways. Rather they aimed to create a truly unique complex that would offer an oasis of serenity and peaceful hospitality to every class of traveler.